How smart do ya hafta be? 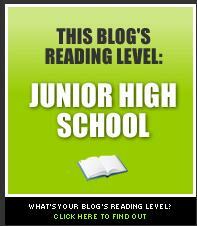 Daniel Wolf found this questionable resource: The Blog Readability Test where you can enter the URL of your blog, and find what level of education is required to understand it. I blushed to see that mine was Junior High School. I immediately put in Alex Ross’s blog and was relieved to find that his was the same; aworks and Jeremy Denk’s required a High School level (I alway find Jeremy’s excellent posts too long to read at this point in my life); The Standing Room was the same as Alex and me. The Overgrown Path requires a genius reading level. I wonder if Shakespeare had a blog what his level would be? That’s basically a level that business writing needs to be to be able to be understood by the many, so I imagine there is nothing to be concerned about. I’d just sprinkle a few more rare words and upgrade, if the junior high grading is bothersome, vexing, and discomfiting. Although the guy (?) does seem to know a lot.